The RHS Chelsea Flower Show is celebrating its centenary. To honour this momentous occasion the Fifth Floor has created a delicious selection of botanical cocktails. Pushing boundaries of flavour beyond the classical botanicals. Gin Mare with its depth of herbal elements and lingering olives is perfectly mixed with thyme, hibiscus syrup and fresh lime juice. A refreshing springtime favourite garnished with hibiscus flower. A simple drink based on the classic Moscow Mule, a refreshing creation that perfectly fits with the ethos of the spring season. Fennel infused Chase vodka is shaken with grapefruit and dill bitters, fresh lemon juice and charged with Luscombe ginger beer. Cool and tasty! of citrus. Perfectly paired to evoke the complexity of the savoury and floral components of these herbal liqueurs. Elegantly crisp! This drink has been designed for the more adventurous and courageous drinkers. “Forbidden Fruit” in-house crafted liqueur made of honey, Edgerton pink gin, infused raspberries and a hint of citrus. port. This is truly a special one! An elegant blend of Crème de Violette, fresh berries, Chase marmalade vodka and Prucia plum liqueur charged with Perrier--Jouët brut Champagne nv, served well chilled and dressed with a dried rose petal. The perfect way to begin your evening. Inspired by spring blossoms, a delicious mix of Cantaloupe and watermelon crushed with strawberries, peach purée, rose syrup and charged with Harvey Nichols rosé Champagne. 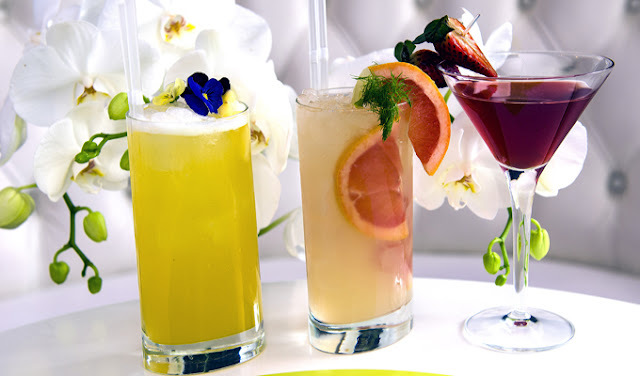 What a wonderful idea, Flowery cocktails! And to celebrate such a great event.